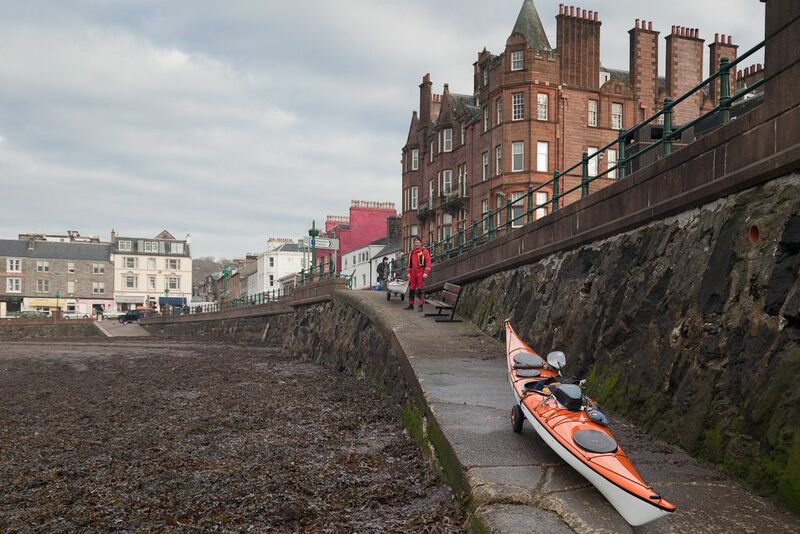 Scotland always been lucky to have a good number of really excellent sea kayak retailers. In the past I have posted about the late Mike Thomson of Scottish Paddler supplies and the good folk Geoff and Anne Turner of |Kari-tek in Ayrshire. This time I want to highlight Stuart and Cathy Wagstaff of Sea Kayak Oban. Their shop is situated right in the heart of Oban only 250m from the railway station and 50m from the beach! The above photo shows the view through the main doors into the covered reception area. The main shop is inside the yellow building straight ahead, the offices and coffee room/briefing area to the right. Further storage, changing/drying rooms are out of shot to the right. I have never seen so many sea kayaks in one place before. 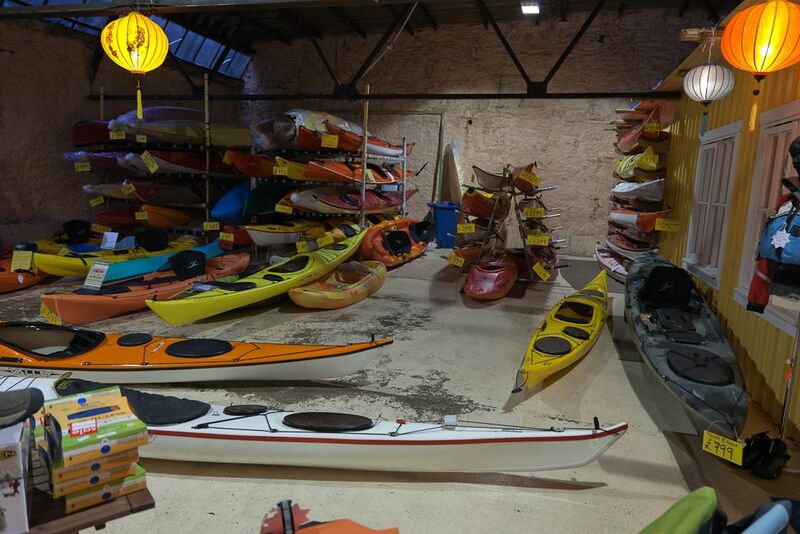 This is only some of the new kayak display, the rest are inside the main shop. The demo and outfitting fleets and crates of unloaded new season kayaks are stored elsewhere in the extensive building. Please note, the white Nordkapp LV in the foreground is not for sale. It is very much mine! 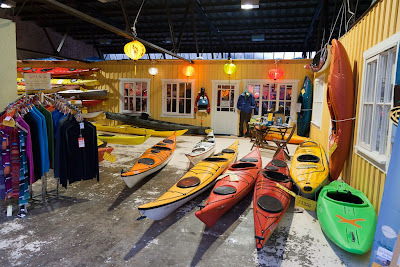 Inside the main shop there are more new kayaks plus all the usual sea kayaking accessories. 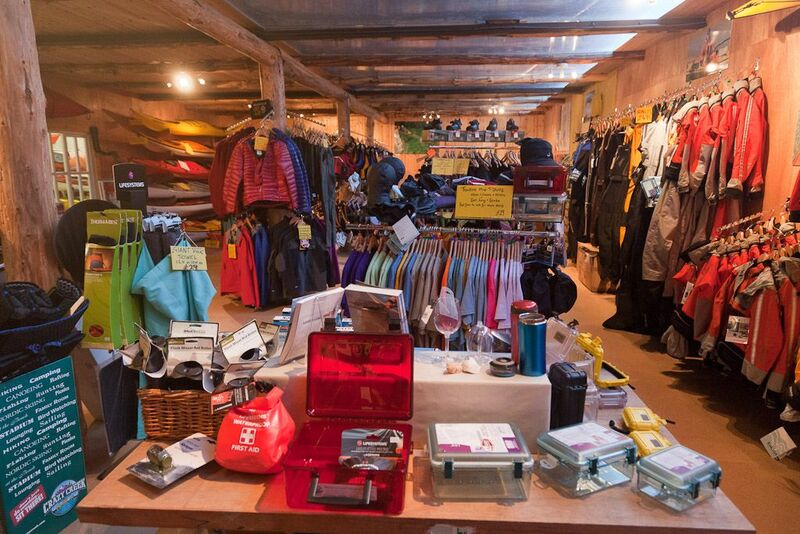 The shop also stocks mainstream outdoor gear from brands like Mountain Hardwear but at very competitive prices, compared with the city stores such as Tiso or Cotswold Outdoor. There is a reading corner, with chairs, to browse the many brochures and magazines and books for sale. Stuart Wagstaff (right) and his wife Cathy made Phil (left) and I very welcome with a cup of freshly brewed coffee when we arrived at 0840. The coffee area has some very useful displays of mannequins wearing what a newcomer might wear while sea kayaking and what an aficionado might wear. There are also heated and dehumidified changing rooms for those taking part in coaching sessions, which the shop arrange, or for those borrowing demo kayaks or hiring kayaks and camping gear from the shop's extensive outfitting department. 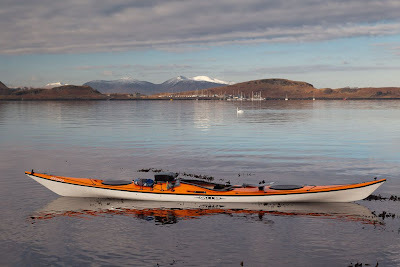 You could fly into Scotland and arrive in Oban with just hand luggage by bus or train or perhaps fly into Oban airport or even land in the bay by seaplane from Glasgow. 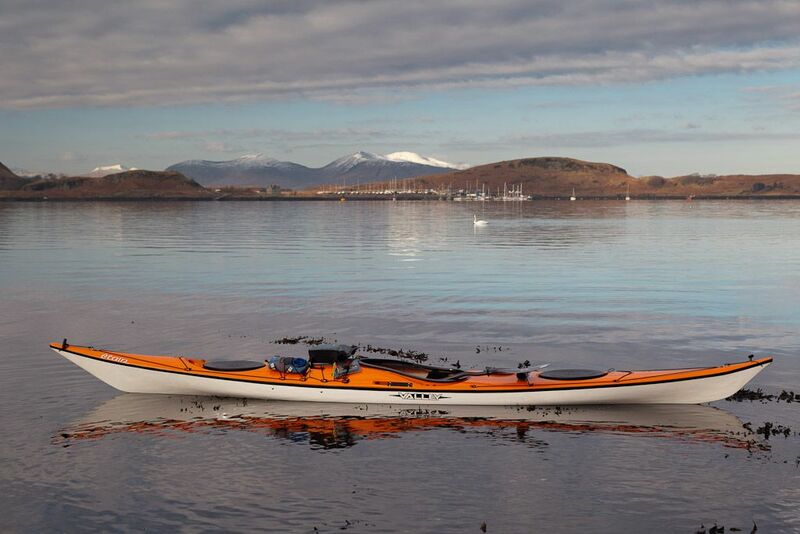 Within an hour or so, you could be fully kitted out and setting off on a sea kayaking expedition. With a demo kayak on the trolley, it took only two minutes to get to the beach. This is the view 50m from the front door of Sea Kayak Oban, the West coast beckons! It is a great shop in a great location,. 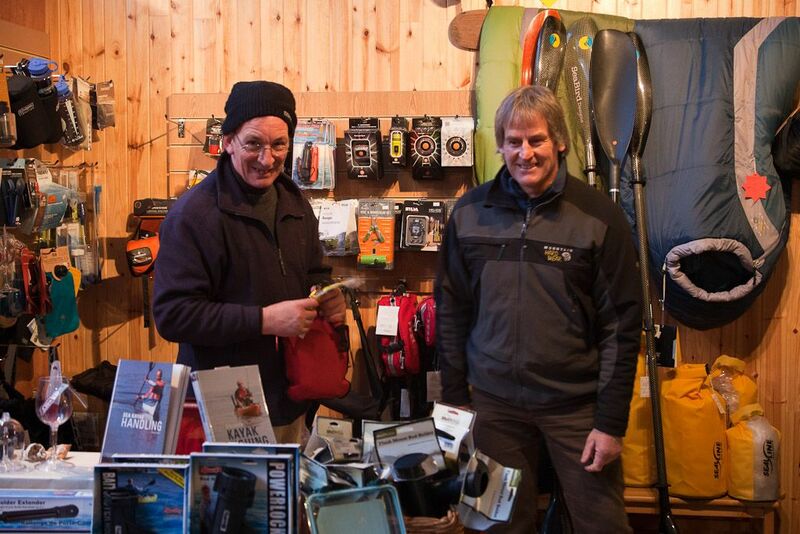 The combination must make it one of the World's best sea kayak retailers!